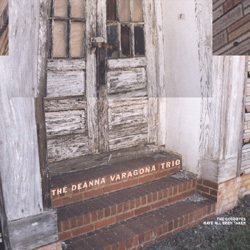 The Deanna Varagona Trio "The Goodbyes Have All Been Taken. Hello"
"The Goodbyes Have All Been Taken. Hello"
Gadfly Records is proud to announce the release of The Goodbyes Have All Been Taken. Hello, the new release from alt-country songstress Deanna Varagona. Singer/songwriter/multi-instrumentalist Deanna Varagona cuts a wide swath with this collection that ranges from folk to twang, and she shines on each track. A member of cult band Lambchop, Varagona’s craft at songwriting shines --- she doesn’t forget to include a melody! — and her voice goes from Patsy Cline to K.D. Lang and back. An American original, Varagona won’t be mistaken for somebody else! Deanna creates a sparse yet dynamic backdrop to highlight her poetic lyrics reminiscent of early Etta James' passion and Bessie Smith’s wiles. She lays her southern soul bare with a passion born in the Appalachian Mountains but bred in a world of a punk rock youth. From the school of Hazel Dickens, The Replacements and Bob Dylan, she tells a tale sometimes strewn with imagery, sometimes naked, with a voice both powerful and sweet. Deanna Varagona has put in years as a member of Nashville’s eclectic orchestra, Lambchop, a contributor to the sweet country swing of Paul Burch & the WPA Ballclub, and as a sidekick siren for Chris Mills. At the same time, she has been seen sitting in on baritone sax or sweet harmonies with the likes of Yo La Tengo, John Wesley Harding, Neutral Milk Hotel, and the Silos.